Panzerkampfwagen VI Ausf E Tiger I (SdKfz 181) Trumnummer (Turret Number) 133 of Schwere SS Panzer Abteilung 101, 1.Kompanie, 3.Zug (Platoon) 3rd vehicle, commanded by SS-Oberscharfuhrer (Warrant Officer) Fritz Zahner passes the Hotel du Lion d'Or run by the van Nieuverberg family in Morgny. Note the Type 166 Schwimmwagen at the extreme right. 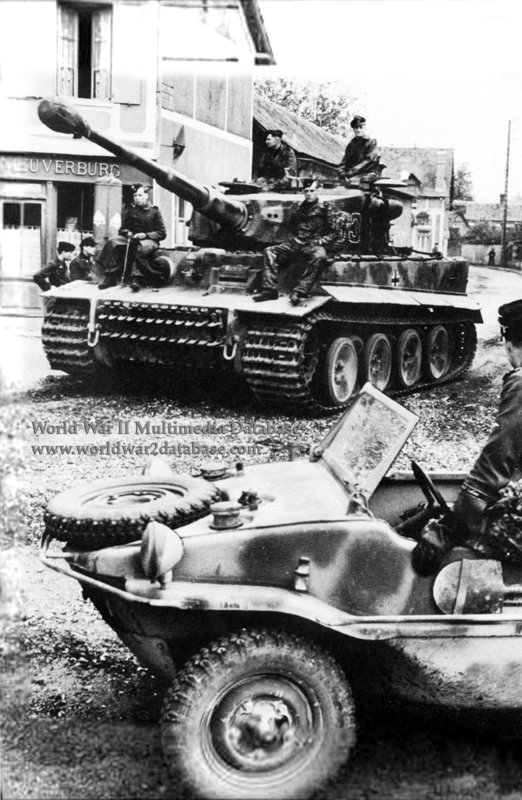 Attached to 1st SS Division "Liebstandarte Adolf Hitler," Schwere SS Panzer Abteilung 101 had thirty-seven Tiger Is operational and eight under repair on June 1, 1944. After a difficult road march marked by breakdowns and air attack, the Battalion moves from Beauvais on June 7 to Normandy near Caen on June 12. The next day, elements of 2.Kompanie stop the British advance on Caen in the Battle of Villers-Bocage. By July 3, 1.Kompanie had three Tigers left, and turned them over to 3.Kompanie and left for Paderborn to reequip with Tiger IIs. Date Estimated.